It's up to all of us to ensure the Scottish Government works to provide more ethical and affordable alternatives in our communities. One of the first battles I started after being elected to parliament was against high street loan sharks. The Debtbusters campaign I set up as a backbench MSP in 2011 targeted the pay-day lenders in Edinburgh and across the UK who were profiting from the cost of living crisis. Britain’s payday loan industry was worth £2.2 billion and 8m loans were made a year, often to pay for food and gas and electricity bills. The campaign was created for three reasons: to take on payday loan companies street by street; to improve debt relief; and to promote the alternative, credit unions. The small matter of two General Elections, a Holyrood election, two referenda and two council elections occupied much of my time in the years that followed. But the Debtbusters campaign always remained a passion for me, and earlier this month there was a real moment of celebration. A new community bank branch was opened in Leith by actor Michael Sheen: the Castle Community Bank, which is a not-for-profit credit union. Despite already being a member of Capital Credit Union, I was proud to sign up to become one of Castle Community Banks newest members. I was also delighted to table a motion in the Scottish Parliament to celebrate this event. In April 2013 I remember campaigning in Leith with local Co-operative Party councillor Gordon Munro and others to highlight the fact there were no fewer than 11 cash loan shops within two minutes of the Newkirkgate at the foot of Leith Walk. The Castle Community Bank is on Great Junction Street, just a stone’s throw from Newkirkgate. At a time when the big high street banks are closing down branches, this is a huge boost for financial services in the capital. While much of the focus has rightly been on the impact of branch closures in rural towns and villages, Edinburgh has actually seen the steepest drop in bank numbers since 2010, falling 60 per cent. Ethical, co-operative alternatives can fill the void. But there is work to do to promote credit unions, which is why the involvement of people like Michael Sheen is vital to generate media interest. I remember once promoting the issue on the set of BBC soap River City as we tried to save the character Scarlett Mullen, who was in a tremendous amount of payday loan debt. It also requires political investment. When Labour ran the administration in Glasgow City Council, a tremendous amount of work was done to take on payday loan companies. It adopted one of the most progressive anti-payday loan policy in the UK; examining the advertising, pensions, planning, rates relief and the rents that credit unions could pay to give them an advantage over payday loan companies. 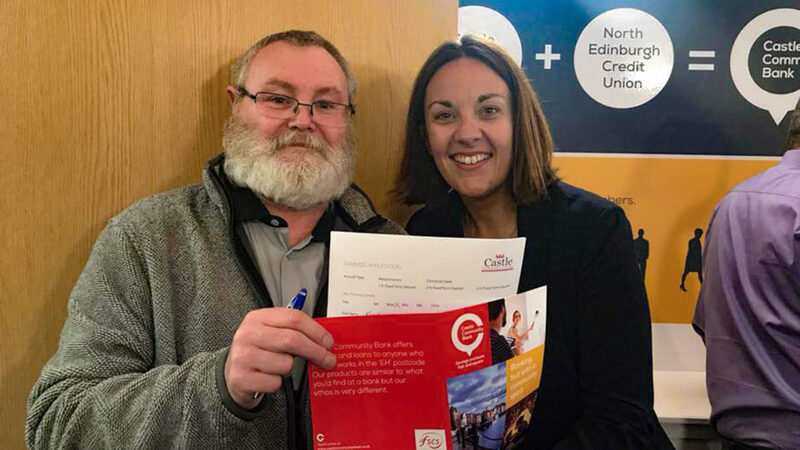 Labour and Co-operative councillors set up a £500,000 budget annually to give transformative grants to co-operatives, mutuals and social enterprises. Today, the Co-operative Party is taking the lead with its Ownership Matters campaign, promoting the idea of community wealth. First developed in the ‘rust belt’ of the USA which was hit by post-industrialisation, community wealth is based on the idea of bringing together people, small businesses and public institutions to work together. It can be difficult for co-operative enterprises to access affordable finance so that’s why we need politicians who are co-operators. We should be proud that we have one in Scottish Labour leader Richard Leonard, who for years has made the case why ownership matters. Our challenge now is to make the Scottish Government look are ways to ensure there are more ethical and affordable alternatives in our communities.